For this challenge I chose one pizza that I remember having at a wine bar back home in San Antonio, Texas that was just so tasty ... and I was lucky enough to have found a food blogger with a YUMMO recipe for it. 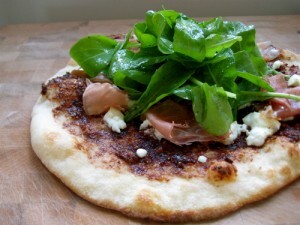 Then in the spirit of blogger networking, I decided to choose 2 pizza recipes from <a href="http://www.foodbuzz.com/project_food_blog/challenges/5" target="_blank">the Challenge #5 of Project Food Blog</a> that made my mouth water! So here you are … 3 DELICIOUS pizza recipes and wine pairings for each! Ok, I have to admit this challenge was an easier one to prepare than the previous ones, and it couldn’t have happened at a better time … I am just days away from leaving to Vienna for the European Wine Blogger’s Conference (#EWBC)!!! As you may have read in a previous post, I am doing my Masters in Wine Business internship/thesis with Catavino. They are co-organizers of the #EWBC, along with Wine Conversation, and as an intern I have been super lucky to help them with some background work in preparation for this conference! It has been a great experience to catch a glimpse of what goes on ‘backstage’ for one of these events! There just might be one thing getting in the way of my travel plans though – French strikes! Yes, the French are at it again! This strike is in reaction to the French government wanting to increase the retirement age and the strikes have gone so far as to involve the oil refineries, which cuts the gas supply … and guess what that means? Yup … The Ceci Sipper’s travel plans are possibly at stake! Now I don’t want to get ahead of myself, maybe this thing will just pass over and I will make it to Vienna and be able to blog to my hearts content … but keep me in your thoughts/prayers/lucky charm rubs/mantras, whatever … I gotta get to the #EWBC!! I JUST GOTTA! I mean, I even had Vinously Speaking t-shirts made to wear to this event!! In any case, back to the Challenge! For this challenge I chose one pizza that I remember having at a wine bar back home in San Antonio, Texas that was just so tasty … and I was lucky enough to have found a food blogger with a YUMMO recipe for it. Then in the spirit of blogger networking, I decided to choose 2 pizza recipes from the Challenge #5 of Project Food Blog that made my mouth water! 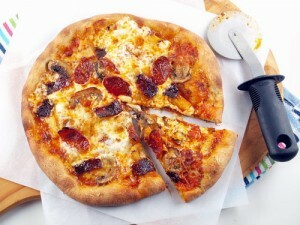 So here you are … 3 DELICIOUS pizza recipes and wine pairings for each! The zinfandel will balance with the fruitiness of the figs, the acid/creaminess of the goat cheese, and the saltiness of the prosciutto! This is the pizza I had at a San Antonio wine bar! So simple, yet so DELICIOUS! 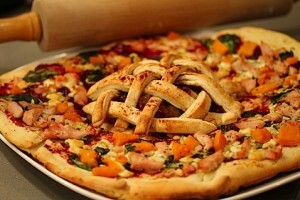 I saw this pizza on the Project Food Blog Challenge #5 and I was INTRIGUED! Sounds like an awesome idea to me! So why a Pinot Noir? The fruity, softer, and lower tannin characters of this variety make it THE wine to pair with the array of Thanksgiving dishes on the table, so with this pizza, it can stand up to all various flavors you will find. You could also get away with having an off-dry Gewurztraminer (or Riesling), especially with the acidity to balance with the food. And when you get to the center of this pizza, this pairing works as well! The more cinnamon/brown spices you use, the more Gewurztraminer will work! w/ …. GASP! ….. Shiner Bock Beer! Ahhhh! A wine blogger said “BEER!” …. hahaha, just kidding. We wine bloggers like our beers too! Anyways, I love spicy foods, so including a spicy style pizza was a must. I came across this recipe on Project Food Blog Challenge #5 as well and when I saw the neat variation on the pizza dough of adding Shiner Bock beer … I was sold! If you are not a fan of beer … well leave it out of the recipe and I would suggest something along the lines of a nice dry rosé to counter the spice on this pizza! Hope you enjoyed the suggestions! I know I am looking forward to making these recipes and of course sipping on the wines … or beer!